Rick & Morty fans may have to wait a while for the beloved show to return after the recent conclusion of its third season, but they also have something arguably even more exciting to look forward to in the short term. That's because McDonald's is bringing back its long-discontinued Szechuan Sauce for one day only this month, following a long campaign from fans of the hit Adult Swim show. On October 7, McDonald's will once again unleash its sweet, sweet Szechuan Sauce, which was previously only available for a very limited time in 1998, at many of its restaurants across the country. In case you missed the strange saga leading up to this big news, the first episode of the show's third season revealed that Rick, the intergalactic-traveling grandpa, was driven by an intense obsession with the storied McNugget dipping sauce, which originally debuted as a promotion tied to the release of Disney's Mulan in 1998. The plot point stoked Szechuan Sauce mania in fans, who actually began petitioning Mickey D's to bring it back in real life. The golden arches bit, and ended up sending jugs of the stuff to the series creator and three lucky fans this summer. Now, it appears they're responding to the pleas of Szechuan Sauce-lovers far and wide by bringing it back for all customers, but just for the single day. Specifically, you'll be able to get your hands on packets of the hot chicken nugget accessory at participating McDonald's location starting at 2pm local time, when you buy a four-, six-, or 10-piece order of Buttermilk Crispy Tenders in-store while supplies last. Unfortunately, the sauce won't be available at every location, but you can scout out exactly where it'll be ahead of time using this handy website. Just remember, Szechuan fever is definitely real, so you'd be wise to line up early if you want a taste. 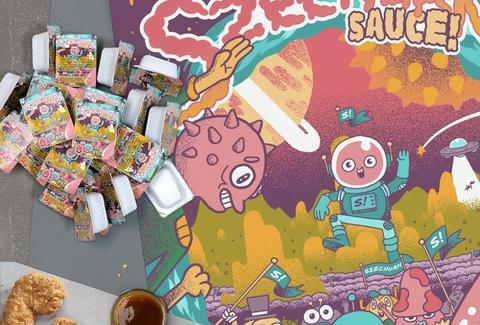 If, like Rick, you have a next-level passion for a particular dipping sauce, Mickey D's will also drop limited edition screen printed posters paying homage to its suite of 10 condiments like Honey Mustard, Spicy Buffalo, a brand-new "Signature" sauce, Sweet & Sour, and of course, Szechuan, on the same day. Let this be a lesson to never underestimate the power of persistent and passionate fans of weird late-night cartoons.